Nutrient cycling is an essential process in an ecosystem. In the nutrient cycle, the usage of the nutrients in the environment, their movement and the processes their recycling are described. Important nutrients include carbon, oxygen, hydrogen, phosphorus and nitrogen are required to be recycled for the existence of organisms. Nutrients cycles involve not only living organisms, but non-living components as well. 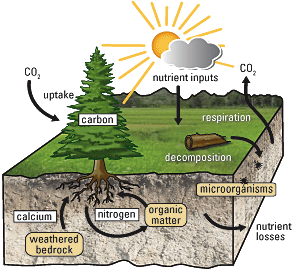 They also involve biological, geological, and chemical processes and thus, these nutrient circuits are also known as biogeochemical cycles.